You checked (and double checked) to make sure you didn’t leave anything behind when you checked out of your hotel or returned your rental car. But did you check (and double check) to make sure you weren’t bringing home any tiny stowaways? Bed bugs are notorious for hitching rides on unsuspecting travelers, and since they are so hard to get rid of, do yourself a favor and learn how to avoid them in the first place. Learn the most common signs of bed bugs, and what to do if you see them. First, check reviews of the hotel where you intend to stay, and take any mention of bed bugs seriously. It’s better to change plans than to risk bringing bed bugs home. Next, it matters where you set your luggage. Bed bugs can’t travel well on smooth surfaces, so as soon as you get to your room, place your luggage in the bathtub or on the luggage rack. You can also put your luggage inside a large garbage bag for further protection. Don’t put your clothes in the drawers or closets. Don’t flop down on that bed yet, either. Use a flashlight to inspect your room before you make another move. Bed bugs can be found where their hosts can be found. (Psst… their host is you and any other living human.) At a minimum, you’ll want to thoroughly inspect the bed, headboard, and nightstand. Anything with nooks and crannies (like an alarm clock or drapes) is fair game for a bed bug, and merits inspection by you. Shine the light on the front and back of the bed’s headboard, the screw holes in the nightstand, the corners of drawers, and along the seams of the mattress or box spring. Look for the bugs themselves (they are usually flat, reddish-brown, and about the size of an apple seed), but also look for tiny black dots that resemble pepper flakes. These are bed bug feces. If you notice any tiny black dots or tiny blood spots, get out of there! 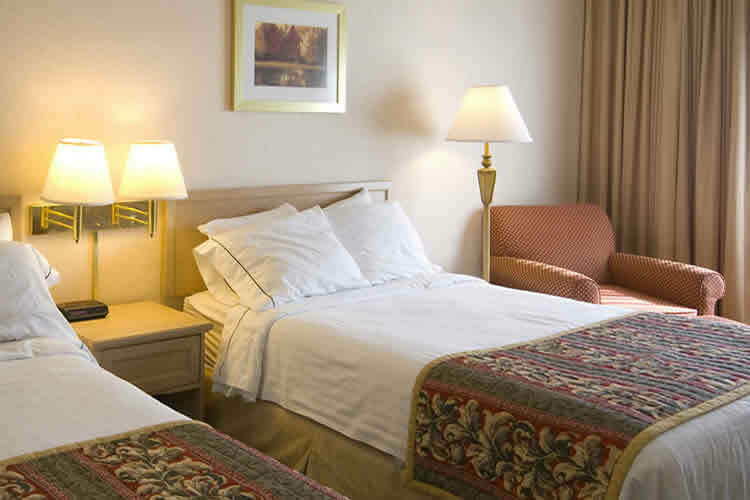 If, after inspecting the room, you feel it’s free of bed bugs, still continue to be cautious about your luggage, keeping it in the bathroom or on a luggage rack. Yes, surprisingly bed bugs can be found in rental cars. Fortunately, they hate heat, so the chances of encountering bed bugs in the summer is lessened. However, since they avoid heat, they may stay in the car but migrate into the trunk or under the spare tire. Use your trusty flashlight again to shine light in those places – no matter the weather. Before you go inside your home, use your flashlight to inspect all the crannies of your luggage. Check zipper pockets, seams, and folds. Even if you don’t find signs of bed bugs, launder all clothing and luggage in hot water as soon as you arrive home. If you think you may have brought bed bugs home, throw everything (including the clothes you’re wearing) into the dryer. Run the dryer for a minimum of 30 minutes on the hottest setting. If you use collapsible luggage, this will be much easier. If it’s too late for that, you’ll need to call a good pest control company to help you eradicate the bed bugs for good. Fortunately, most travelers never come in contact with bed bugs, but since the little pests don’t discriminate, it’s important to always be on alert no matter where you’re staying.